Looking back at this we ate a lot of chicken this week! We bought the majority of our shopping from Aldi this week and it was around the £50 mark. We planned our meals based on store cupboard ingredients we already had at home - we had a fajita spice mix in the cupboard so used it to make fajitas, we now buy our rice in big bags (rather than those microwave pouches) so had plenty to bulk out our stir fry, Steve used his homemade breadcrumbs from the freezer to make the Schnitzel and we used some of the spices we were given for Christmas to make a madras. We already had a jar of pesto and pasta in our cupboard too. The only time we splashed out was on Friday with an M&S meal deal. We used some of a gift card we were given for Christmas to pay for this treat. I've already started thinking about how we'll pay for Christmas 2017. I cancelled my usual Park savings at the beginning of the year and joined intu's saving club instead. What I like about intu's Christmas saving scheme is that the bonus is a lot higher (up to £25 - t&c's apply) and you don't need to set up a direct debit - you can just top up as and when. As a freelancer with unstable income, this suits me much better. You can read more about intu Metrocentre's Christmas Savings Club here. Our local Aldi is only a 10 minute walk away. We always used to take the car as it was easier (aka lazier). Petrol is one of our biggest weekly expenses and I'm keen to keep this to a minimum. This week we walked to Aldi and shared carrying our shopping between us. It was actually nice and we said we'll do the same next week. I have been hunting out some free/low cost things to do at the weekend. We have never visited the Discovery Museum so will be heading there on Saturday afternoon and on Saturday night we're heading to our friend's house for an 80's party. We have a nice little group and every 2 months or so we'll take it in turns to host a night with a difference. So far we've had a Halloween party, a Disney party and now 80's night. It only costs us the price of our alcohol (and maybe a taxi home) but is a massive saving when you compare this to going out on the town. I am really chuffed that we haven't caved in and ordered a takeaway yet. That's not to say I wasn't tempted though. The kids were driving me up the wall on Saturday and by the time night time hit and Steve came in from work, I really couldn't be bothered to cook. We stuck to our guns though and cooked dinner together which was nice. Things didn't go so well through the week though when we visited intu Metrocentre to join their Christmas savings club and start our holiday clothes shopping with a few vouchers we had. We made the mistake of visiting over lunch time and couldn't resist lunch. We did choose a good deal though - 2 Burritos and chips and dips to share for £12 at Bar Burrito. Including drinks lunch was around £15. It was worth it though - so delicious! In future, I'll plan to visit places straight after a meal so we aren't so tempted. 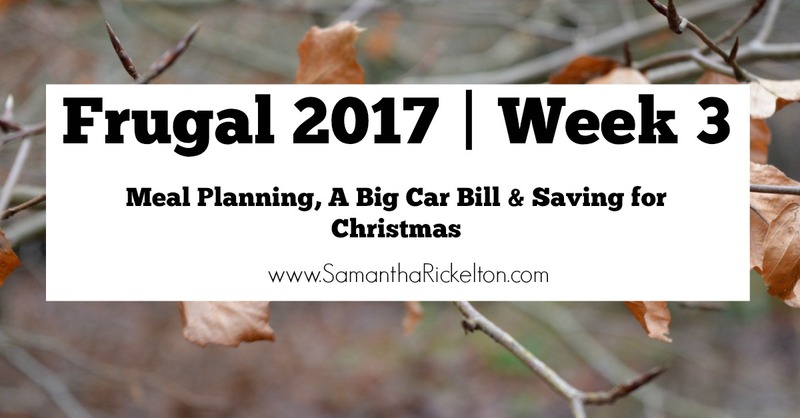 This week we were also hit with another car bill that went into triple figures. Annoying! I don't know - how are you supposed to save for a car when your current car costs so much? I try to see the positives in everything though and our car has now had pretty much everything replaced that could go wrong so it should be ok until it's MOT in August. Here's hoping anyway! Make sure you like SamanthaRickelton.com's Facebook page here and check back next Friday for another update. It's great to see how well it's going for you so far (except the car!) Our meal planning is a bit hit and miss so far: the plan itself seems a good start and I have a freezer full of meals I've cooked but my husband seems to have been out half the time so we really haven't stuck to it as it was all designed for two to eat. Still... fewer takeaways and I guess I'm spending less!